Call Brand It Wrap It today! While your custom vehicle wraps can protect your vehicle’s paint job from everyday hazards of the road, including rock salt, gravel, and other debris, the wraps themselves are unfortunately not indestructible. But when your vehicle wrap is damaged, it doesn’t necessarily mean the end of your vehicle marketing graphics. 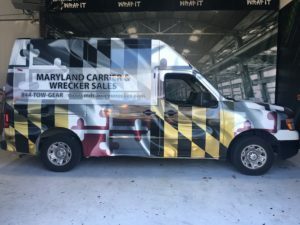 Luckily, there’s hope: you can actually repair many types of damage to vehicle wraps without replacing the entire wrap. Here’s what you should know about car wrap repairs. First things first–you need to clean the damaged area from the vehicle’s surface. Remove the debris from the damaged area of the vehicle wrap. Any scraps of vehicle wrap should be removed from the vehicle, then wax and grease left behind on the surface should be thoroughly cleaned off. Use a microfiber towel and a mix of soap and water in order to gently but effectively clean the surface of debris. If there are still pieces of the last vehicle wrap stuck to the surface, the vinyl patch won’t stick as well or as seamlessly. Next, you need to make sure any remnants have been completely removed. Even if you peel off damaged parts of the vehicle wrap, tiny pieces and adhesive may be left behind. While the first step is about cleaning the vehicle’s surface, this step is really focused on removing whatever has been left behind. You may need to take a sand block or wet sandpaper to the wet area in order to totally remove damaged pieces of vinyl. Following sanding, you’ll want to go back over the area with soap and water and a microfiber towel to fully clean and prepare the area for a vinyl patch. A vinyl patch can be used to repair a damaged vinyl wrap. You’ll need to measure a vinyl patch that will not only cover the damaged area, but actually overlap with the current vinyl wrap in order to make sure the patch looks seamless in the design of your vehicle wrap. It’s especially important when applying a vinyl patch to go over the surface with your fingers or a squeegee tool, working out any bubbles to avoid further damage and making sure the patch looks clean and seamless as possible. This entry was posted on Thursday, January 24th, 2019 at 1:44 pm. Both comments and pings are currently closed.